In Sunday mass worshipers were making queue to take Holy Communion when two armed terrorists entered to attack Bethel Memorial Methodist Church Quetta. In this incident 11 Christians died and 57 got injured. One victim of Quetta church Yousaf, migrated 16 years ago to Balochistan from Punjab, when his wife who is a government school teacher transferred in Quetta. Yousaf works in insurance company. His 13 years old daughter died in Quetta church terror attack, while his 16 year old sister in admitted in the hospital who is still in critical condition. According to brigadier (R) Samson Simon Sharaf, a political analyst told that there were four attackers. “They were equipped with ample ammunition supply and were aiming to take worshipers hostage and kill them one by one, prolonging the scene of terror as much as they could,” he told. The church security guard George Masih was the first man killed, who tried to stop the terrorists from entering the church premises. His body has been sent to his village in Punjab for burial. 70 young volunteers are working to supply blood, food and other assistance to the injured. They are arranging for coffins for the burial too. 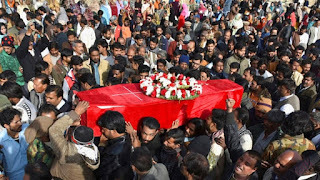 Victims of the Quetta church attack who lost their lives were laid to rest in the Gora graveyard on 18 December after their funeral mass at the Sacred Heart Cathedral in the presence of hundreds of mourners and tight security. 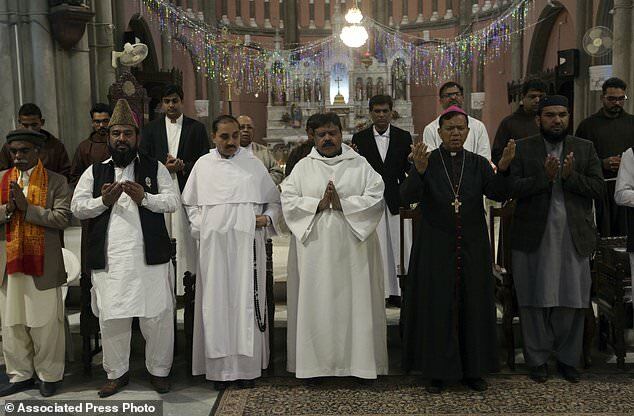 Christians and religious leaders from other faiths attended the funeral service of the dead ones. Karachi Bishop Sadiq Denial, Bishop Victor Nana Pargasum and other 25 pastors reached Quetta from different parts of the country to attend the last rites of the Quetta church victims. In the funeral procession former provincial minister Jaffar George of Pakistan People Party and MPAs William Barkat of the Pakhtunkhwa Milli Awami Party and Tahir Mehmood of the ruling Pakistan Muslim League Nawaz were also present. 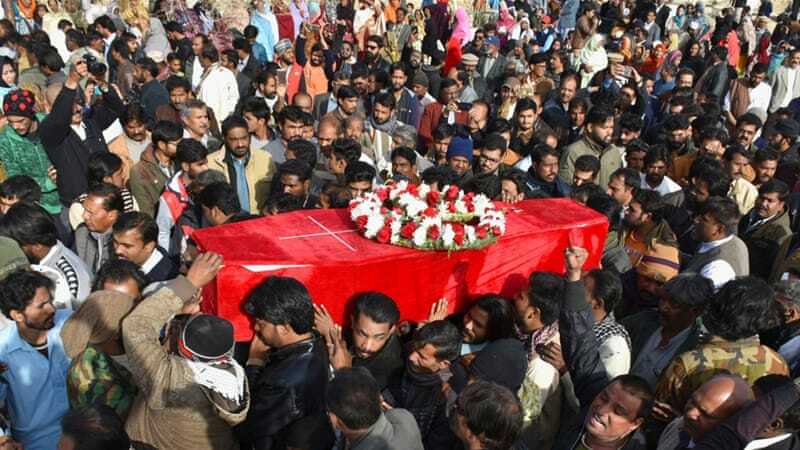 Balochistan Chief Minister Nawab Sanaullah Zehri announced a compensation of Rs1 million for each martyrs and Rs500,000 for each the injured. He also announced to give Rs1.5 million to the police officers who bravely fought against the terrorists. He assured to recommend the name of the church guard, for president award. In Punjab Christians protested outside Lahore Press Club after the church attack. They declared that Pakistan government does not make enough security arrangements to protect Pakistanis citizens against Islamic extremists. The chief minister of Balochistan later told that strict security would be provided to Christian community during Christmas ceremonies. Over 3,000 security personnel are deployed in Quetta city especially for churches. The government has decided to high alert security at religious places like churches, mosques, Imam bargahs and educational institutions and public places in the whole country.